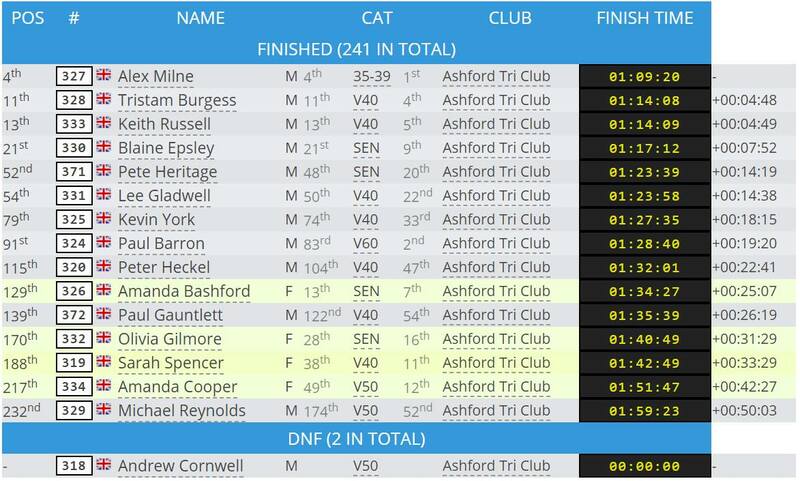 This year, Ashford Tri Club entered a competitive male team and a competitive female team in the relay event. The club was represented by Greg Wood, Alex Milne and Tristam Burgess for the males and Lissa Mitchell, Danyel Carter and Jennifer Kearns for the females. 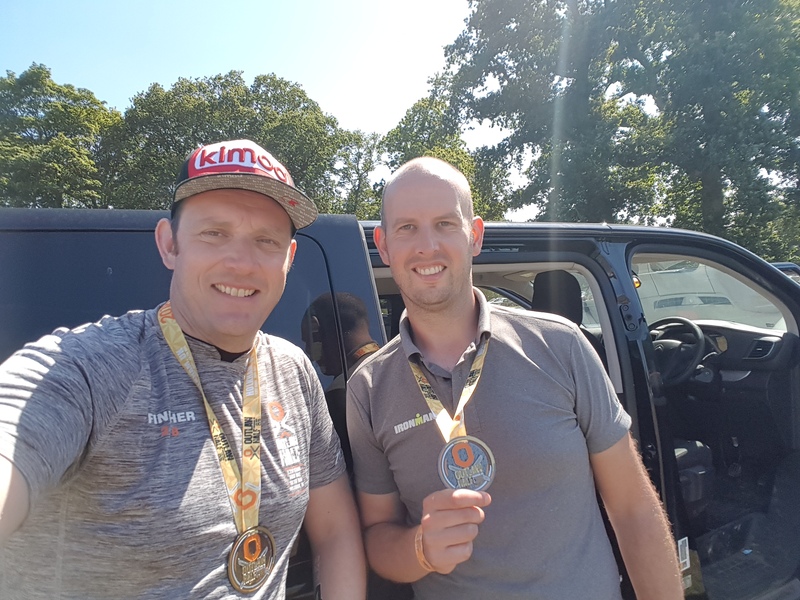 On the 29th of July 2018, OSB Events held their ever popular full distance triathlon, the Outlaw. The event was held in the middle of an incredible heatwave; temperatures reaching the mid 30s on a daily basis. However, in a whirlwind of mis-fortune (literally), the heatwave was put on hold for the weekend and replaced with heavy rainstorms and winds reaching 40mph – a far cry from the conditions experienced during training. During briefing, the day before, we were informed of a change to the swim, cutting it short for three laps instead of the usual one lap. The organisers had decided to do this to avoid swimming up the far end of the lake where the water is less sheltered and the winds can make the surface a bit choppy. Although disc wheels were not banned on the bike, they were certainly not recommended; a point that Alex would not let us forget for the next twenty four hours or so. Our chairman, Garry Curley, did a fantastic job looking after us and keeping us well fed and watered. Sunday morning we woke up in a slightly crowded environment – Joey Chasseaud, competing in the individual event, had arrived to find the hotel he was booked into was boarded up. The swimmers were at the start line on time (just), and the race got under way. Greg left the water and made it into transition in 51:37 and Lissa came in at 1:16:40. The cyclists were probably wetter than the swimmers had been when they arrived back to transition; Alex in 4:56:15 and Danyel in 7:05:19. As the rain died down, the wind took over. After a 3:15:58 run, I joined Alex and Greg to finish the race in 4th place after 9:07:04. Jennifer came in at 4:42:17, and the girls had finished in 35th after 13:06:39. However, we were not the only ATC athletes to make the journey to Nottingham. We also had the following individual entries: Joey Chasseaud – 13:03:55 – 440 Terry Foreman – 13:53:25 – 606 John Kearns – 15:09:50 – 761 Dee Hogwood – DNF (due to the extreme conditions, many athletes didn’t complete the bike within the cut-off) An incredible effort by everyone in extremely challenging conditions. 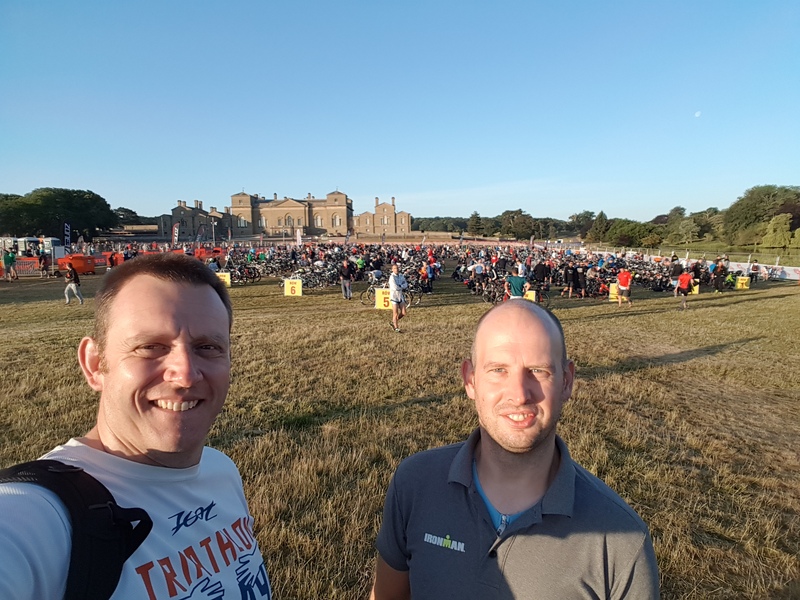 So whilst all focus was quite rightly on the ATC Ironmen and women in Austria last weekend – Martin and I travelled up to Norfolk to take part in the Outlaw Half at Holkham. It would be fair to say that I was under prepared for this event – life/ work/family commitments all taking priority over my training, excuses yes but a reality. I’d trained some but nowhere near as much as the expensive training plan suggested but I’m not one to give up or bail out, so went with the mentality “it’s a brick session and a test for IM70.3 Weymouth” which is later in the year. Swim – Now I’d been told that the lake was known for being 3 parts duck poo and 1 part weeds but assumed that this was a wild exaggeration. It was not. The 5 minutes in the water before the start was vile and the smell… Well I’ll leave that to your imagination. Anyway, the start horn blew and I found a rhythm straight away and avoided fighting with the competitors around me whilst mentally blocking out the fact that I was swimming in a sewer. 1900m turned into 2100m and 42 minutes later I was exiting. T1 – Out the water and handed a bottle of water straight away by the marshals – told this was because it was going to be warm but I think it was to distil the taste of the lake from my mouth! Over to my rack, wetsuit off and bike sorted with no dramas – not a particularly quick transition but ok. I’d spotted that Martin’s bike was gone, as he started in a different wave, so I knew he was out safe and away. 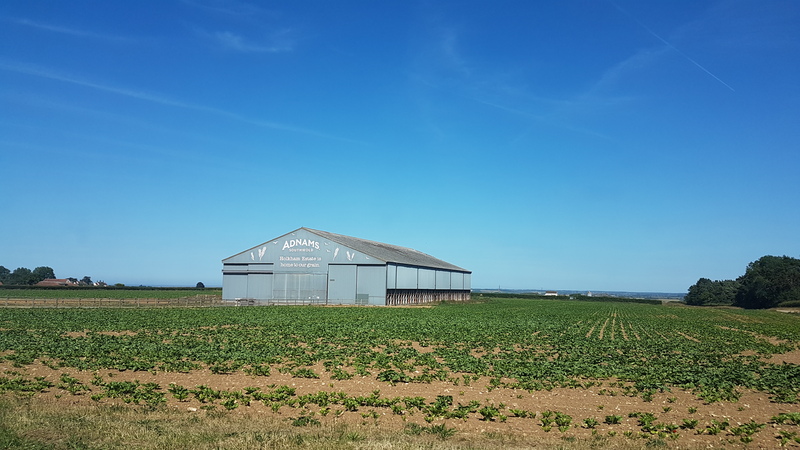 Ride – 57ish miles through some lovely undulating countryside – rode past Sandringham and saw some of the Queen’s horses, then into a headwind for 14 miles along the A184 which wasn’t great. Still no mechanicals, just good solid riding keeping a good pace with a low HR. Happy days! Saw Martin, who had just started the run, as I rode back into T2. T2 – Slow as I needed to apply some sun lotion and have a wee. Now for the hard part, the run…. Run – x3 7km loops of hills during the hottest day of the year! Prior to the race Martin and I discussed our plans for the run. He had a plan of 7min/KM and he found a pace and just kept going. I didn’t have a plan or pace as it turned out……..
Suffice to say I achieved a PW for my half marathon which involved a lot of walking, stopping at every station for water and stuffing my tri-suit with wet sponges to keep cool and ensuring that the lovely marshals with the sun tan lotion just kept covering me in it. The end finally came and I crossed the line in 6.46 (2.38 of that was the run). Bragging Rights to Martin on this one – quicker by a minute overall – as of the both of us he was slightly better prepared having raced the brutal midnight marathon the week before?!? – a well-deserved win. Despite the above, the event was well organised, supported and the location was stunning. I’d definitely recommend it. Now to do some proper training for Weymouth. After an early wake up, met Keith at 05.30 who kindly offered to car share, loaded up his van and off to Swanley. We arrived in good time, about 06.30, headed to registration and signed on. The nice lady asked ‘how long do you estimate your swim time will be’ ? Giving an approximate time she handed me an 07.30 start which was great, especially on hearing Keiths answer to the same question!!!! After making a complete hash of the HBT across the board, this time I paced myself. Though not fast, completed the 400 mtrs / 12 lengths swim without incident and left the pool pleased with the way I got into a rhythm and stuck with it. Into T1 …. quick dry off, race belt on (I remembered this time! ), shoes, helmet and off to the exit. Was nice to have Alex encouraging me even if I did head out though the ‘in’ gate – quickly rectified and back on course. The bike leg was a pleasant ‘undulating’ route through town and country. At on point I saw a cyclist in front and made them a target to catch – this almost took me off course…. The cyclist was a ‘local’ out for a Sunday spin and in chasing the down, I nearly missed a right turn, thankfully the Marshal noticed what I was up too and put me straight. Back to T2, bike racked, helmet off, footwear change and off to the run. The run started on road uphill to Swanley Park. It was a nice run, twice around the park mostly on gravel paths with a small section though a wooded area. Back down the hill, along the road and to the finish. On crossing the finish line, you receive you medal and then the choice of water or beer. Ok so it was alcohol free Erdinger, but it was still nice. There was a great atmosphere and from comments made everyone enjoyed the event ..
Now looking forward to Leeds Castle ..
ATC Team were, Keith, Olivia, Lee, Aisling, Sally Dee and of course me…. The weekend of June the 9th and 10th saw the ITU World Triathlon Series come to Leeds for the third year. 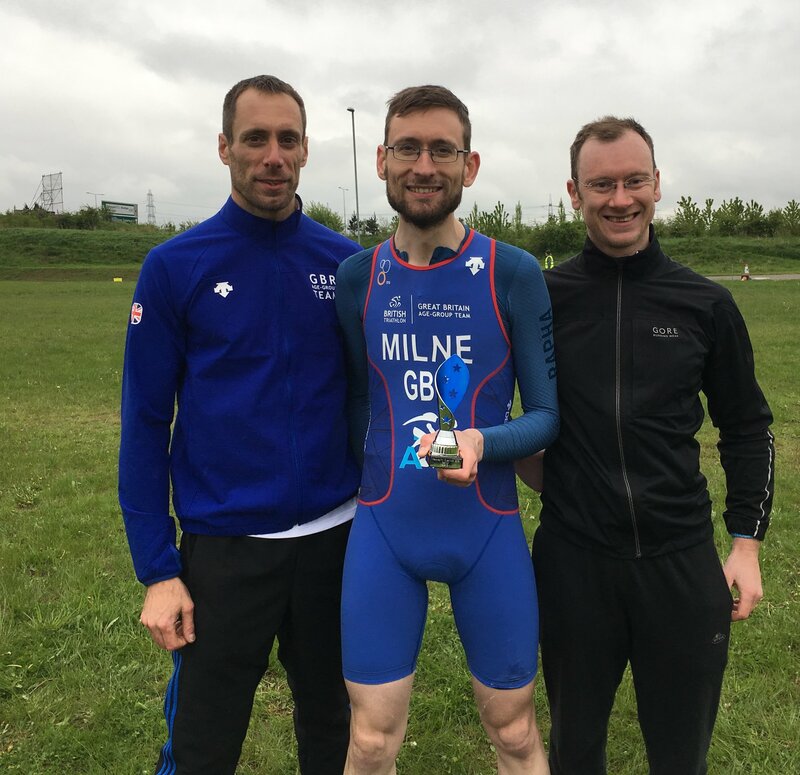 This year, the BTF held their standard distance championship at Leeds, and selected the same event as a qualifier for next years ETU European age group standard distance championship. With all of these factors present, this race was set to be a serious one. When racking the bike the evening before, I realised just how big this event actually was – It was huge! On the morning of the race, even though I felt like I had arrived in the middle of the night, I really hadn’t given myself enough time to set up. I only remembered my goggles as I was putting my bag in the bag drop. Fog had seriously reduced visibility, so the organisers took a cautious move to reduce the swim to just the 750m sprint/elite lap for all the men’s championship waves. I was a bit disappointed as I had prepared for a full swim, but was also somewhat relieved. In the water and the horn sounds. Turns out they don’t count down or say “get ready”, they just blow a horn and you go. And go I did. I positioned well in the swim early, which meant no fisticuffs, well, not until the “queue” to get up the ramp. Out of the water and over the timing mat in 14:15. Transition felt like a mile away. I counted the racks and found my bike straight away! That was my first challenge completed. Another long run towards the mount line and I was finally out of T1 in 5:04. As I ran round the corner to mount my bike, the guy in front fell over (a lot of the competitors had opted to don their shoes in transition in fear or the uphill mount). This forced me outside of the cones, where I was free to jump on my bike and continue up the hill and out on to the closed roads towards Headingley and back, twice, to complete the 36.2km route. After a great bike leg, I removed my feet from my shoes and dismounted as smoothly as I had mounted and my bike was done in 1:05:53. I counted the racks again and found my trainers. Second challenge completed. Out of T2 in 2:16. All that was left was a 10km run into and around town. With burning quads and slight confusion over where I was going, I made it onto the blue carpet to finish under the ITU banner, completing the run in 39:39 and finishing the whole event in 2:07:06, just inside the 120% required to qualify for Europe. So there I was on a glorious sunny Saturday cruising north (ok crawling through the A14 roadworks), heading for the National Water Sports Centre in Nottingham, ready to put all that hard earned virtual training to good use (it is the planning to do the training that counts…right?…). First stop the campsite next to the centre and having set up my luxury overnight accommodation it was a short walk to registration followed by the mandatory 40 minute race briefing in a baking hot marquee crammed with 300 eager triathletes, where we were reminded of all the material in the race info that we had meant to read but never got round to, with some great video animations covering all aspects of the race. Race organiser Iain Hamilton casually mentioned that Will Clarke, Phil Graves, Lucy Charles and Lucy Gossage would be racing – ah so they’ve brought out the big guns to challenge me – glad I’d brought the faster of my ATC trisuits – the mark 1 ATC suit (aka Victorian bathing costume) would have to wait for another day. Just time for a few pints of the cold erdinger for hydration and a chance to catch the action from the Sprint Tri. Fortunately, I avoided oversleeping thanks the fellow camper who had kindly primed their dog to start barking at 2am for a good 10 minutes, followed by the steady drones of cars arriving at 4am ready for the carpark to open at 5. Time to walk bleary eyed to transition and rack my bike and have those last minute – oh bugger I forgot to bring…. moments (despite having packed the kitchen sink). Still – bike, helmet, 2 types of shoes, wetsuit, sorted. With calm conditions and a beautiful day in store there were no kit choice dilemmas – just the main challenge – having gained a ‘few’ extra pounds, would that extra tight fitting wetsuit ever get on – just as well I had an hour or so before the start of my wave, which also gave me chance to see the elite wave exiting the swim in 24 minutes for the 1900m. With about 300 in each wave and nearly the whole width of the lake to start in, the swim start wasn’t too much of a bun fight, although I spent most of the first section with someone feeling me up – friendly lot these triathletes. After a tardy 41 minute swim, time to jump on the bike – first 3 miles is a circuit of the rowing lake, flat, no traffic and chance to get settled, before heading out to the dual carriageway and a coned off lane for the next few miles, all pan flat. With calm conditions and a warm start to the day it’s ideal conditions and we’re cruising at a steady 20mph+. We peel off the dual carriageway at Radcliffe and wend our way through the streets, with every junction well marshalled, followed by the slight climb up to Shelford before dropping back down to the main road. A right turn at the roundabout (or island in this part of the world) takes us north for the next 10 miles to Oxton, and, apart from the bridge over the Trent, the road surface is good and traffic is quiet. Back into transition and the familiar post bike jelly legs for the start of the run – this is where the lack of winter bike miles really bites you in the bum – the temperature’s now a very pleasant 23/24oC and a mere 13 miles to go – smile/grimace – at least the course is pan flat. The run takes you out to a towpath along the Trent – hot dusty limestone, before returning you to complete a 5k lap of the rowing lake on the tarmac perimeter road, then repeat. Plenty of aid stations (about every 1.3 miles) and a great crowd cheering everyone on. 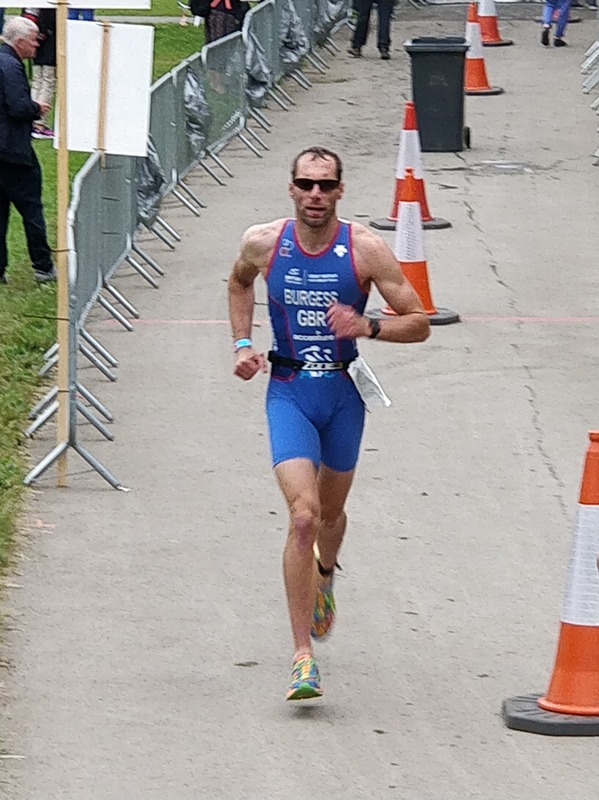 Back to the top of the lake on the 2nd lap, 2.5k to go and 15 minutes left to beat the 6 hour mark – bugger, time to try running – a good final flourish saw me cross the line in 5:58, with a 2:15 for the run and just a tad behind the winning time of 4:02. 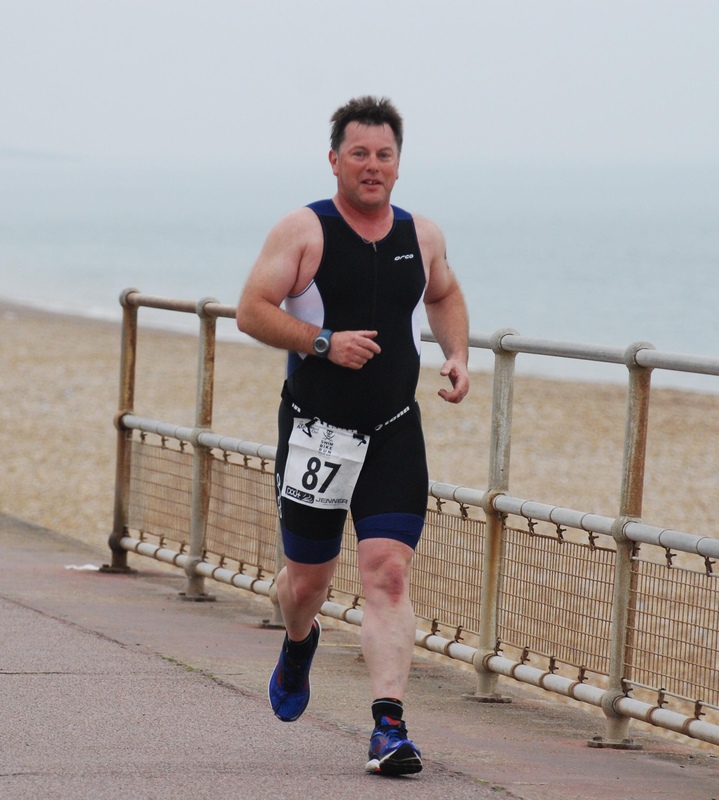 After years of wondering if I could manage a triathlon, Hythe Bay 2017 was my first real experience of the sport. It was tough but I loved every second of it. I soon joined Ashford Tri club and signed up to the 2018 race as soon as I could. Having joined ATC and attending training sessions throughout the year, I was more prepared and even more excited for the 2018 Hythe Bay tri. I arrived at Hythe pool with an hour to go before my set swim time. Registration was quick and simple; goodie bag, t shirt, chip and race number sorted, I was ready to go. After quite a bit of faffing around setting up my transition space, I was free to cheer on lots of familiar faces as they set off on their run section. Finally it was time to go into the pool. Nerves kicked in but after a thorough race brief and (quite) a few deep breaths, I was ready to go. Swimming is probably my strongest discipline, counting lengths however, is not. Thankfully it was a ‘up and down and under’ swim, taking all counting out of the equation and leaving me plenty of time to think about how steep the hill is that I was about to cycle. 10 lengths came and went pretty quickly and I was soon out of the pool and into transition. I managed to remember where my bike was and get myself sorted for the ride, stopping for a couple of jelly babies to boost me along. Out onto the road and I not so gracefully hopped onto my bike and off I went. I found the ride tough at times, especially up Sandgate hill but all the marshals waving and shouting encouragement pushed me along. After a bumpy ride along Princes parade, it was time to flounder off my bike and get back through transition. Bike dropped off and shoes changed, a quick stumble up the steps and I was out onto the sea front. The run section is a lovely flat out and back route, which I’d normally enjoy. However today those 1km markers felt miles apart and had it not been for the promise of jelly babies at the half way point, I may well have walked a good part of the first half. A swig of water and some encouragement from the marshals meant I was set for the last 2.5 km to the finish. I pushed myself on the way back to try and speed up a bit which I felt I achieved. About 1km away from the finish a ‘high five’ from a fellow club member gave me the oomph to pick it up another gear and make a strong finish. 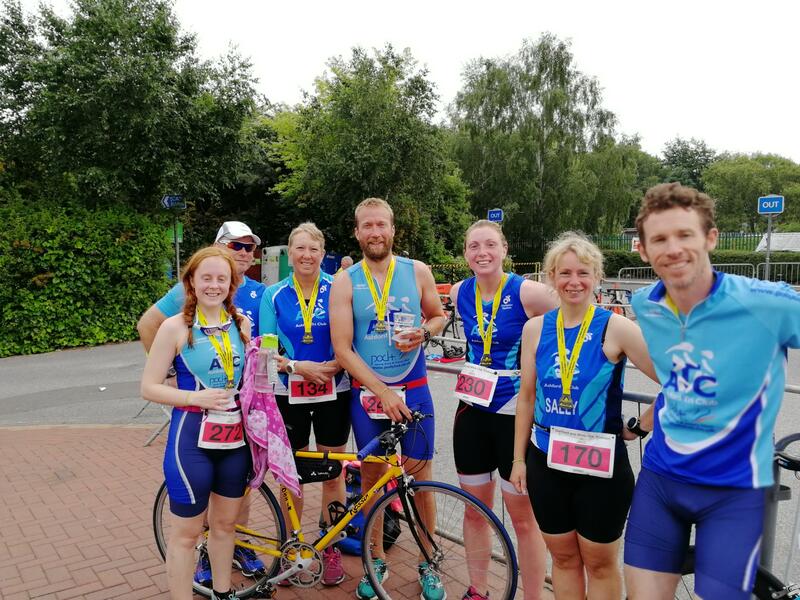 Hythe bay triathlon is truly an amazing event, where total beginners and seasoned triathletes compete together in a friendly and supported atmosphere. 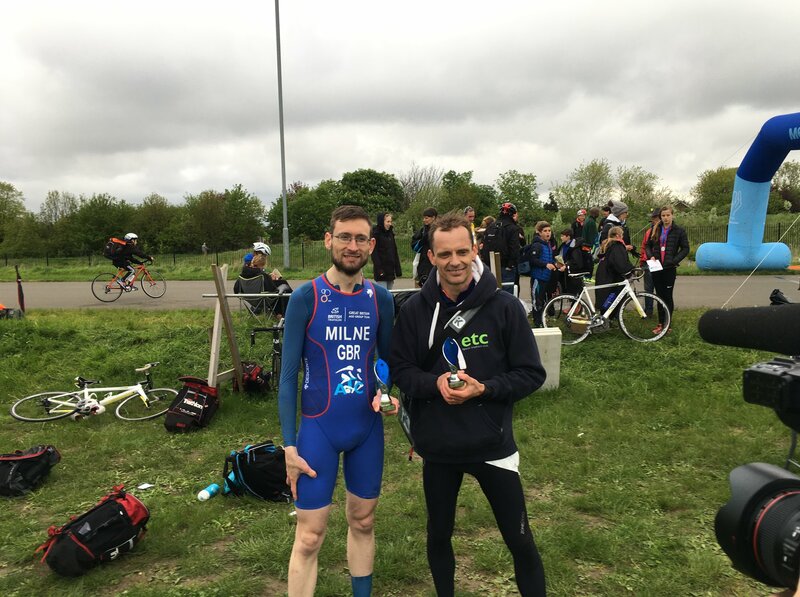 Ashford Tri club has a great ethos of making everyone feel welcome no matter what their background, ability or goals are; I’d recommend joining a training session to anyone! Fast forward 6 months and we were on top of a hill, in an ancient castle at the start line in Begur, wondering yet again why we hadn’t done any training and desperately trying to find a pair we thought we could beat (we couldn’t). Injuries and life had really got in the way of this one and my longest run was only 9 miles and my 2km morning swims started feeling woefully inadequate. With an advertised 36km of running with 25 swims totalling 8.5km ahead of us, it was going to be a long day. We assumed our usual starting position at the back, just in case the Swedish Special Forces team decided to kill us with one steely look, and the starting horn sounded. Cue a 3.5km stampede down to the first swim 250m below us. We were told in the race briefing (in between beers) that the first half of the race was “testing”. This proved to be quite accurate if you consider death defying drops, ridiculous rock climbing and hair raising rope aided descents “testing”. The longest run was 5.2km and this took us nearly 1hr 30min, which might tell you how testing it was!!!! Still, the scenery was spectacular, the swims at this point were quite sheltered and most importantly we weren’t last and were having that stupid type of masochistic fun! As we slowly worked our way along the coast the wind picked up and the swims became more and more exposed. It was at this point my lack of swim fitness started to show and I was massively regretting not bringing the tether we have used in the past. The head wind had caused a slow river effect to the water and this, coupled with the chop meant I was starting to struggle. Andy tried his best to swim slow enough to give me a drag but even his old lady side stroke was proving an issue to follow. There were less hills in the second half and we could finally get some run/shuffle miles in between the numerous swims but it was definitely getting tough. It finally got to the stage where we were pitifully asking marshalls “how far it was to the end?” “Just 2 km and 2 swims left” was one response we heard with relief. A soul destroying 5km and 8 swims later, we finally got to the last beach where Tori and Lisa were waiting for us, they seemed slightly concerned by our red faces and inability to raise our feet more than an inch off the floor!!!. They sprinted off to the finish line as we “only” had one swim to go, which Andy had assured me was just a 200m out and back before the 500m run to the finish line. As we turned the corner and saw it was about 700m into the current and waves, I had a sense of humour failure and seriously wondered if I could do it and whether it would be cheating to get into the shallower water and just pretend I was swimming as I walked along the sea bed. I took my man up pills, followed the slowly drowning Andy and with a large amount of relief, swearing and even a little tear managed to get through it and after a short run through the streets, Team GingerLee made it to the finish line in 9hrs 53min and in 38th place. 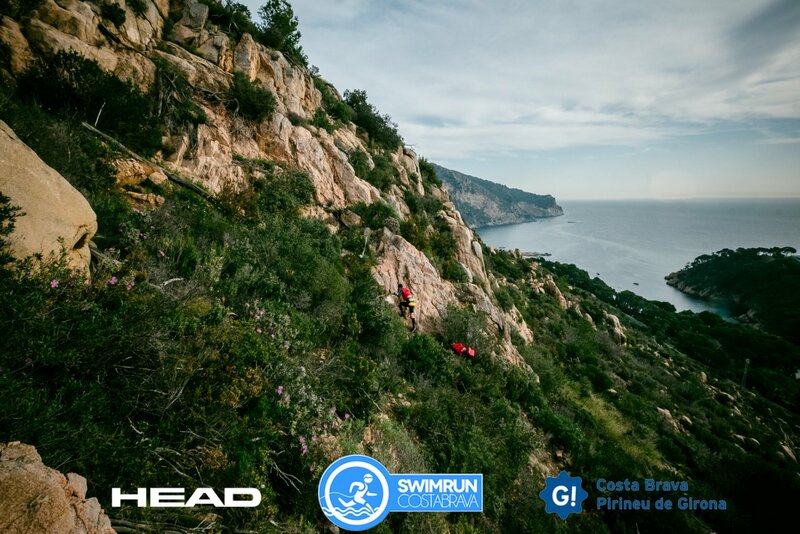 Reading some reports from others participant’s, the swim totalled about 10km in the end and there was over 2400m of climbing on the run (we must read these things before signing up). The 2 burgers on the way back to the hotel was the start of an enjoyable recovery period in the sun that made the race even more special. Anyway, if you’ve made it this far without falling asleep, DO A SWIMRUN!!!! They’re amazing events, tough, hard, soul searching but ultimately wholly rewarding. Just do some training beforehand !!!!!!!!!!!! Once again, the ATC sprint championship was to be in East Grinstead. 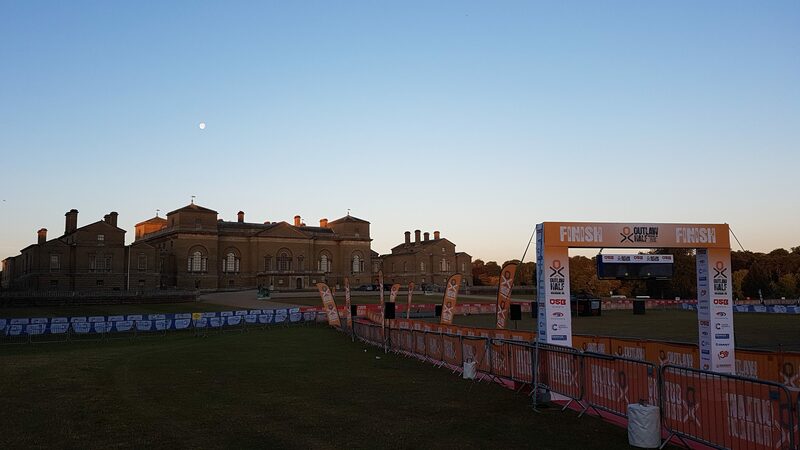 A cold, yet dry, start to the day greeted the Ashford triathletes. At 8:40, we took over the whole pool, and after a technical timing issue (ever common at EG), the pool was filled with eager swimmers clad in blue. The race stayed dry and first across the line for the club for the second year in a row, and to retain his sprint champion title, was Alex Milne in 4th position (2nd in age group) with 1:09:20, followed by myself with 1:14:08 (11th overall) and Keith Russell one second behind with 1:14:09 (13th overall). Paul Barron won the Ultra-vet category with 1:28:40 (92nd overall). First female over the line was Amanda Magnabosco, also for the second year running and retaining her sprint champion title, in 1:34:27 (13th female). She was followed by Olivia Gilmore with 1:40:49 (29th female), and Sarah Spencer with 1:42:49 (38th female). Mandy Cooper won the super-vet category with 1:51:47 (49th female). Great racing and support from everyone involved! This year ATC have entered into the Triathlon England South East (TESE) Region Club Senior Series. This duathlon being the first race of the series. With the need to score in at least three races, we managed to get the minimum of three members to score in the male competition. With the start time for the adult race being 16:40, the day seemed to be spent hanging around in anticipation. This did allow plenty of time to ensure that there were no technical issues with the bikes. Alex Milne decided not to take advantage of this opportunity, and had to make a last minute “bodge” to his front mech in the car park. Eventually we racked our bikes and the race started pretty much on time. Although that is one race in the bag for the males, we are yet to get off the starting blocks in the female and mixed competitions. There are four competitions we can compete in. Male, Female and mixed, in which we require at least three entries into at least three events for each category. First three finishers for the club in each category score points and if males and females score in the same event, we also score in the mixed competition. There is also a mob competition where the club scores points simply for the number of entries.